Stock photo of the southern wall of the Mezquita (Cathedral-Mosque) at night in the City of Cordoba, UNESCO World Heritage Site, Province of Cordoba, Andalusia (Andalucia), Spain, Europe. The archways of exterior southern wall of the Mezquita glow in the evening of the city of Cordoba. 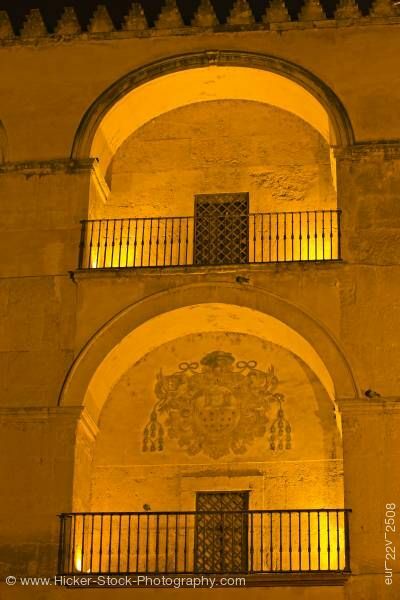 This stock photo shows the exterior of the southern wall of the Mezquita (Cathedral-Mosque) at night in the City of Cordoba, UNESCO World Heritage Site, Province of Cordoba, Andalusia, Spain, Europe. This evening view of the exterior of the southern wall of the Mezquita has two archways with metal railings in front. The second floor archway is not as curved as the lower floor and has a keystone at the center. In each corner of the archways lights glow along the floor. In the center of the archways along the wall is a door that has metal iron with a diamond grid pattern. The first floor above the door has a decorative emblem on the stone wall. Southern wall of the Mezquita (Cathedral-Mosque) at night in the City of Cordoba, UNESCO World Heritage Site, Province of Cordoba, Andalusia (Andalucia), Spain, Europe.